HBase is defined many different ways, I think most often its called a BigTable clone or a column-oriented datastore. I like to think of HBase as simply a two-dimensional associative array, or a two-dimensional hash map if you will. But is that it? For most HBase users, that might suffice, but HBase has a feature that you need to know about – column families. Column families are one layer above the column keys. The reason even novice developers need to know about column families in HBase is because you MUST define column families for each table that we create in HBase (column families are the entities that need to be pre-defined while creating a HBase table). So are HBase rows actually three-dimensional hash maps? Not really, column families are always “fused” together with the column key. 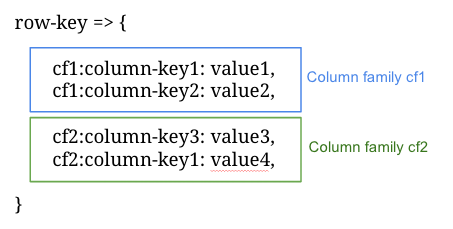 You can think of column keys in HBase as a combination of the column family and your user-defined column key itself. Thus, as in the above example, you can use the same user-defined column key across multiple column-families. OK, now we have that out of the way. Is that it? Actually, there is one more small thing to HBase column keys and values – HBase actually versions key-values written into columns! You can specify the number of versions to store for HBase (by default, I believe it is three); it internally keep that many versions in its store, and remove them eventually (through marking them with “tombstones” for eventual deletion, another advanced topic). In the above example, the value for cf1:column-key1 for row-key has been updated at three times (timestamp t1, t2 and t3). When a default query for row-key and cf1:column-key1 is issued, HBase only returns the latest value (“2” in this case). But it is possible to query all versions of a certain row/column key query … and in fact, specify timestamp filters as well! The last thing about the HBase data structure is that it stores everything as bytes internally. So internally, HBase makes no differentiation, and this is something to keep in mind while storing (and reading) data to (and from) HBase.